I am far enough behind with sleeve installations that we are not accepting any more sleeve replacements. Call me any time if you need advice on your machine. Having 2-Stroke or 4-Stroke Cylinder problems? Contact me, I can help. Why do we bore cylinders for such a reasonable cost? Our only business is top end cylinder work & related projects. A good part of our production is Mail Order, with a Medium Priority freight post office box the charge is $12.00 & change each way. This makes our mail order cylinder service competitive. We can talk about your riding style & power requirements. Most times we can change your port timing so your machine performs to the way you ride. Big bore kits & Small bore kits are our specialty, Quick as a Wink O-Ring Grooves. ﻿Any type of cylinder, Blind bores, no problem. We can replace your Plated cylinder & return your engine to life with a new Iron Liner. Give us a call before you spend hundreds $$$ for that special Trick Kit. We may be able to suprise you with Special Possibilities. As I’m heading towards retirement in the next few years, I’m happy to pass along what I can. I have knowledge to share with you for free. World wide we have friends who we are working with. Ask me a question, I may be able to help you. It’s not necessary to physically use a degree wheel to obtain the numbers. If you are curious about what your dealer did to the inside of your engine. We will help you understand what they did and why. Over the years, I’ve found that many people have come to their own opinions on how this kind of work should be done. Personal opinions can be blown way out of perportion the more they bounce around the internet. In order to give our customers their best value, there are some things that we will & will not do to your cylinder. We are replacing your sleeve & not doing a cosmetic re-manufacture job. While cooling, your new custom sleeve is being held in place with a light press. We do not do a complete Bead Blast job on your cylinder. 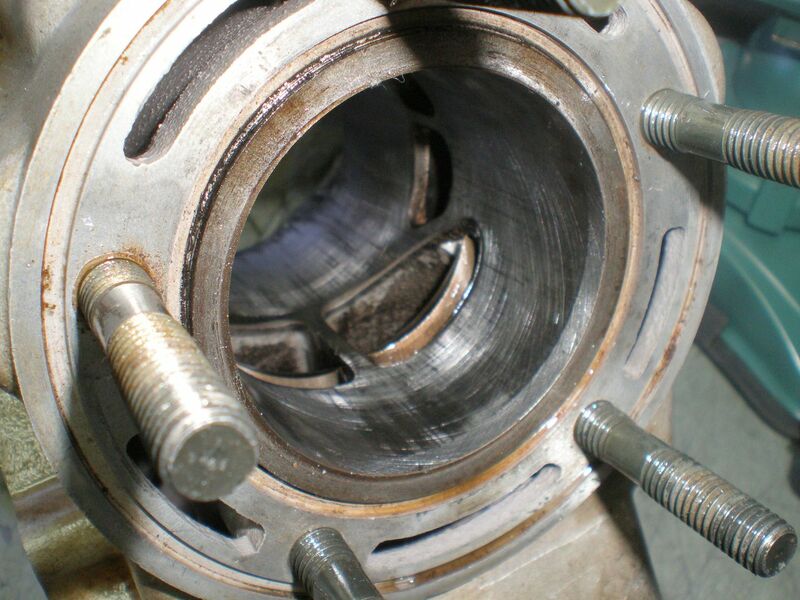 Excessive Bead Blasting can damage any of the threads in your cylinder. We only bevel ports which are in contact with the piston rings. Intake ports are ordinarily not beveled; if the intake ports need to be beveled then they are too large to support the piston. We may recommend that more ribs be installed in your intake ports.Some shops tap & pin the new sleeve so it doesn’t slip, you can see this method on Utube. If the sleeve needs to be pinned then the new parts aren’t fit tight enough. When your new sleeve is loose the hot cylinder won’t dissipate the heat fast enough, your engine has a greater chance of piston seizure. Honing; Egg Beater to Power hone. There are many different ways to hone a cylinder. Hand held hone, Horizontal & Vertical power hones, automatic & manual feed. Short, standard stone & multiple stone racks. Each method can work just fine with a qualified operator. Each method may work better for different situations. There is NEVER 1 best method to hone any cylinder 2 & 4 cycle, through & blind bore. We have been honing cylinders using all methods for many years. 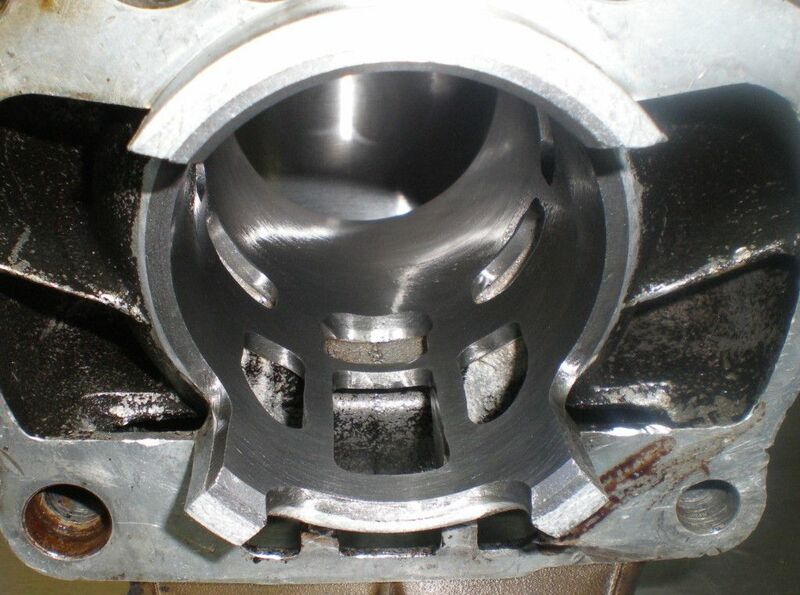 The key is; machine your cylinder Round & Straight no matter what the method. We can sleeve for most any big bore kit that you can find the parts for. With most any big bore kits the power valve must be removed. The manufacturing engineers at the cycle factory never had a big bore kit in mind when they designed your engine. At Small Engine; we manufacture the sleeves from the raw casting up. There is no middle man involved in your custom bore kit. Most people who contact me are concerned about finding their custom sleeves’. Again; I make your custom liner in my humble, retired shop garage. If you decide to go in this direction; you are responsible for finding the piston & gasket sets. If your bore has much more than a 2mm diameter increases, you will need more fuel to feed it, a larger carburetor or injector. If you’re not capable of engineering the required changes & parts, you need to find somebody who can do this for you. Many times we come across a customer who purchased a bore kit from a supply house who provides high performance equipment. The kits may not have any of the proper oversized pistons. The cylinder sleeve can be supplied that is too thin to accept any oversizes. Be careful not to be cheated by a supply house that doesn’t know what their selling. If your cylinder head has a concentric spark plug hole; i.e. in the center of the combustion chamber, The cost charge is included in the bore kit price. A 10-1 corrected compression ratio is recommended for or installations. (147psi cranking compression) The corrected compression ratio is calculated assuming a 180deg. exhaust port duration. We wish to give you your best value on your repairs. Only shopping for price can be a big mistake. Many times a customer has gone elsewhere because of a difference of $25 or so. The customer many times has no idea where his new sleeve came from or how it was installed. If you have questions, please give me a call. Check out “How it’s Done” & you will learn. A little history about Small Engine Machine works Inc. & Northwest Sleeve Co. The question has come up a few times so I thought I’d explain the history some so you all would know what’s going on. In the 50’s & 60’s, I showed an interest in my grand dad’s lawn mowers. Both mowers were 2 strokes with rope pull starters. Each weekend in the summer I’d go to my grand dads’ & earn $5.00 for mowing his lawn, what fun & earning some big cash. My interest in small engines grew more when my father bought me a Go Kart from the local department store. After a few trips to the local Kart track the subject of racing my kart finally came up. Fast forward a few years; 4 years in the navy. I still was tinkering with 2 stroke engines & the subject of cylinder repairs kept coming up. Well my father’s metal shop happened to have an aluminum welder. We started welding motorcycle cases, repairing cylinders kept floating to the surface. I went to a local machinery dealer & purchased a Kwik Way brand cylinder boring machine. That’s how it all started; 2 more Kwik Way’s & a vertical mill. I was so busy boring cylinders that my father suggested that I quit working for the family business & start working for myself. In 1971 I started Small Engine Machine Works Co.; business was to growing as fast as I could bore more cylinders. Next was a distributorship of Wiesco piston & L. A. Sleeve co’s. The business kept growing into a 5 employee shop. 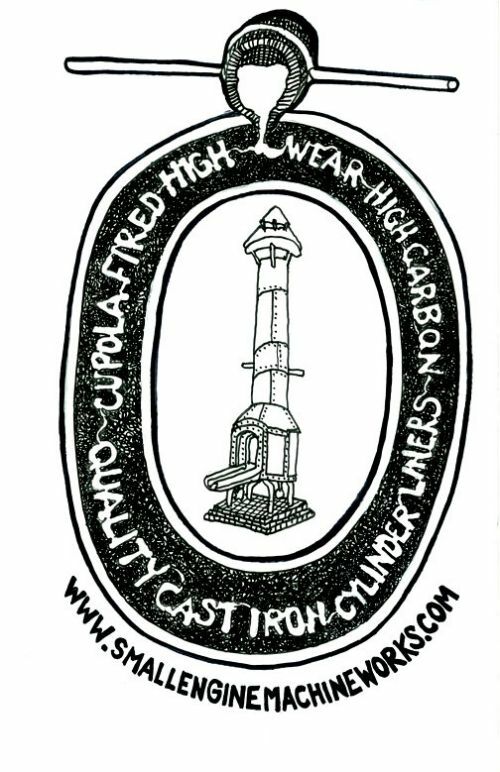 An ad in Cycle World magazine & the sleeve backlog quickly grew to 50 cylinders. As time went by my father became ill with Bone Cancer & I took over the family business. I had an offer to sell Small Engine to Mr. Bill Wagner who renamed the company to Northwest Sleeve. NW Sleeve grew & prospered for some 30 years. The Wagner family finally closed the company for retirement & John Tice started www.smallenginemachineworks.com as a domain name only. In my retirement I’m sleeving & boring cylinders again. Linda Wagner & I have become good friends & the opportunity of acquiring the NW Sleeve.com domain name came to me. So the company has now gone full circle, who will be the next owner?? No matter if you’re a newbie or a seasoned mechanic; you have skills which can be shared in a good conversation. It’s many times necessary to talk over a project with the customer; what is required & what can we do, also how we do the job. There are no secrets here & we wish that the customer completely understands the project from beginning to completion. The liner replacement business is a unique operation but nothing special. All of the skills & procedures required are those of a standard machinist. I’d like everyone to know how all of this is done in order to help sustain the trade. I’m in my 60’s and retired. I wish to pass along as much information as I can to the next generation. My Life time profession has been Precision Machine work & Welding. In the early days, Small Engine cylinder repair. Over the years I’ve found that employees, customers and students have been very responsive to the teachings of a senior fellow in the profession. Did you buy a used Lathe or Milling machine? I’d be happy to help you set it up. Maybe a boring bar or an older Sunnen hone. The older manual machines are just as handy and useful as they have ever been. You might even figure out that you can earn some extra income from your efforts. I’ll bet that you have friends who would pay you for your skills and services. In today’s economy a few extra Bucko’s could help fill your wallet. I started boring cycle cylinders for local dealers at $4.00 per hole. Years later and a lot of hard work has been very satisfying to me. In spite of all the Hype of plated cylinders and the Like, the sleeve business is alive and well. Just take a look at my Links page.